Once the seemingly invincible conquerors of nearly all of East Asia, today relatively little is known of the exact weapons, uniforms, and lifestyle of World War II Japanese soldiers (the Heitai). In this lavishly illustrated book, readers and historians alike can finally glimpse the precise personal effects of the Imperial infantryman. Thanks to a collection carefully nurtured through the decades, every aspect of the Heitai's daily existence is shown in detail with superb color photography accompanied by informative descriptions. Items range from weapons to clothing (both tropical and arctic), eating implements, communications equipment, awards, helmets, insignia, visual devices, gas masks, canteens, cameras, tents and footwear. Also included are propaganda leaflets and simple reading material issued to the Heitai during long, slow periods of service on isolated (sometimes bypassed) Pacific islands. By examining the exact possessions of a Japanese soldier—from dagger to toothbrush, from hand grenade to undergarments—one is able to see history come to life in a way no cinema or text alone could convey. At the same time, it is of interest to note both the differences between an Imperial fighter's equipment with that of a GI, and how in many ways it was similar. 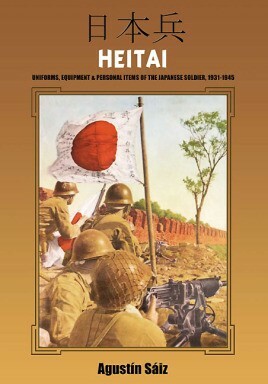 As a companion volume to the bestselling Deutsche Soldaten, this over-sized, one-of-a-kind work on the Imperial Heitai provides a uniquely illuminating view of the Japanese fighting man who was once America's most fearsome enemy.